I'm currently studying Qualitative and Quantitative Analysis in Nonprofit and Public Administration as I head toward obtaining my MPA (Master's in Public Administration). As such, I've been bitching and moaning about this stats class to basically anyone who will listen. Thank Gawd for Dan, who knows how to calculate complex formulas in Excel, and is willing to share his knowledge. A recent conversation about an "incident" at Foundation and the memory of an incident involving me, Nye's, and whiskey got me thinking that it would be more fun to conduct a random, quasiexperimental survey about drunken attacks and whiskey. Yesterday, I asked a bunch of people two questions: 1) Have you ever drunkenly attacked? 2) Was there whiskey involved? About 78% of respondents had drunkenly attacked. 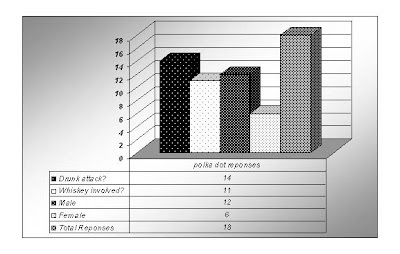 Of those respondents who had drunkenly attacked, 78% indicated that whiskey was involved (although identical, the variables aren't covarying - can't prove nonspuriousness). 66% of the respondents identified themselves as male. 44% of the respondents identified themselves as female. -Some respondents wanted me to define "attack". I didn't. They had to determine for themselves if their action was considered an attack. -Respondents wanted to tell me what other booze was involved. I wasn't interested for this study, but overall, I was interested. -Respondents wanted to know if I (or my study) was "serious". Drunken attackers sometimes drink whiskey.